This is Jon. It's been a couple of days since Delaney's official "Girls only birthday party!" and I still haven't completely recovered yet. Two friends from our church, Megan and Leah, came over to celebrate, make cupcakes, watch High School Musical and run ragged outside on the swing set. 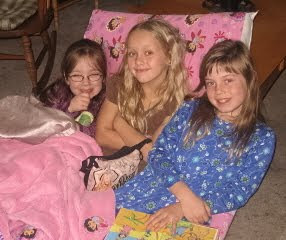 They all had a great time and Delaney slept hard that night. The sugar had nothing to do with this photo. This is typical of the entire day. 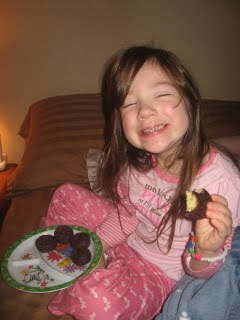 Leah ate every ounce of frosting in sight, Delaney hoarded her cupcakes and Megan showed them off. Bunny ears on the birthday girl. Addy only eats frosting. Then she thoughfully shares the rest with us. Expelling all the sugar energy outside. This is Jon. Blue Grandma and Grandpa (Brittany's parents) came up to celebrate Delaney's fifth birthday on Tuesday. Blue Grandpa found this bike for Delaney. The coordination isn't there quite yet, but she does enjoy riding it, as long as I'm next to her the whole time. Her helmet says "Lil' Strawberry Sheriff." Adelyn had to get into the mix, too. Later, they raced Grandpa down Okanogan Street. He took third place in the race. Third place isn't bad. Right before singing Happy Birthday. 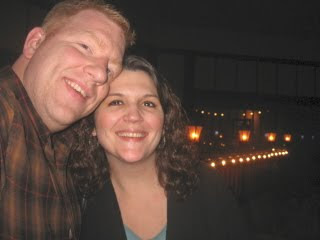 Seven years ago, you said "I do!" Love you, Britty Bear! Daddy takes DRae to third day of school! This is Jon. I took Monday and Tuesday off (19th for our anniversary, 20th for Delaney's birthday) so I got to experience what it's like getting Delaney ready for school after a weekend. Depending on who you ask..........not fun. Actually the fault probably needs to be squarely placed on me since I was doing things that was taking Delaney out of her element. "Dad! You're getting in my way!" "Dad! That's not how we do it!" 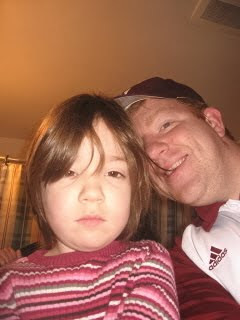 As soon as we hit the porch to walk to school, though, Delaney was excited for another full day of school. After our walk to school, I signed her in incorrectly and got in the way of the other kids trying to get into class. I loved every minute of it. No caption needed here, huh? Delaney has such long and pretty hair that Brittany has to comb it every morning to get the knots and kinks out. DRae doesn't care for that very much. The Guddats visit for Delaney's Birthday! This is Jon. Last weekend, Grandpa Jeff, Grandma Sharon and Great Grandma Hazel joined us east of the mountains to celebrate little Delaney's fifth birthday! She had been looking forward to the visit all week. It's been a tradition over the last three years to meet at the corn maze in Ellensburg to run around the fields, get lost in corn and pick out pumpkins. 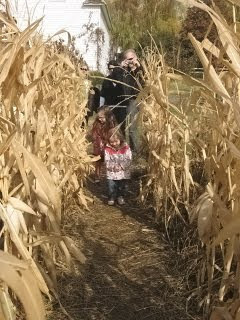 Addy and D-Rae at the beginning of the maze. The girls with their loot. Delaney posing while Addy plays with the wagon more. That girl didn't want to let the wagon go at all. A great pose for three of the people in the picture. A classic pose for Adelyn. As soon as the camera clicks, she looks away.......every time we take a picture. Delaney showing delight while opening a gift from Grandpa and Grandma. Great Grandma Hazel getting hugs after the girls got matching "boy" and "girl" teddy bears (according to Delaney). Making Halloween cookies with Grandma! My Mom came over last weekend and Delaney asked her if we could make Halloween cookies. 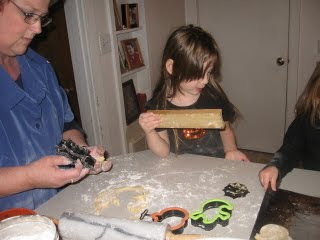 We have a bunch of cute cookie cutters so the girls had lots of fun cutting shapes and learning how to bake with Grandma. Then we frosted them and added lots of frosting, sprinkles and candy. 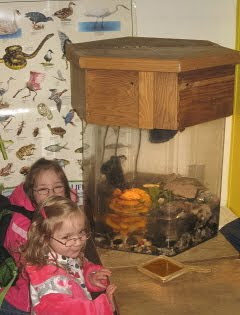 I don't know who had more fun me or the girls! Thanks for the fun Grandma!!! Delaney started her first day of Headstart in Kittitas today. The school is about 2 1/2 blocks from the house so all four of us walked to school and dropped her off. She was so excited and cute with her little backpack on. She did really good when we got there and wasn't nervous or upset. She went right out with her teacher to play with the other kids. Jon and I were a bit stunned because she barely even got upset when we left. Happy, but stunned. Our girl is growing UP!!! 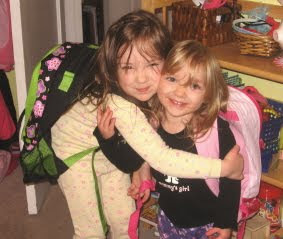 The most tears shed had to have been from baby sister Addy who thought she was going to school too. She got quite upset when she had to leave and tantrums were thrown on the walk home. Delaney said she had fun and made friends yet she couldn't quite remember their names or anything she did today. I do know one thing though: she is cranky! Bedtimes and naptimes will be adjusted to work around school that's for sure. We are sure proud of our big girl who turns 5 on Tuesday, I can't believe it!!! When we found out on Friday that Delaney needed a backpack for school we headed to Freddy's to pick one out. She was really excited to have her first backpack for all her school things. What I didn't count on (but should have expected) was Adelyn wanting a backpack too. While we tried to find the right one for Drae, Addy immediately grabbed onto a puppy backpack and that was it! So needless to say both girls got a new pack and thanks to getting them after school started we got them on sale. YAY! The best thing about Addy's pack is that it's about the same size as her and when she filled it up with her things she literally swayed backward. Drae already has hers all stocked with necessities like her bear and pens and her notebook, she's so cute. Jon and Britty in Leavenworth!